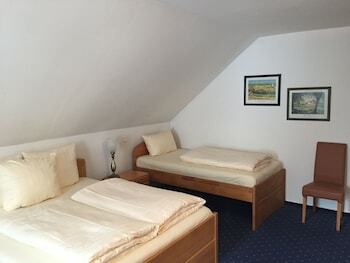 Located in Landstuhl, TDY Homes Hotel Schattner is within a 15-minute drive of Nanstein Castle and Ramstein Air Base. The front desk is staffed during limited hours. Free self parking is available onsite. With a stay at Hotel Augustiner Tor in Constance, you'll be just steps from LAGO Shopping-Center Konstanz and Dreifaltigkeitskirche. The front desk is staffed during limited hours. With a stay at BaseCamp Bonn in Bonn (Dottendorf), you'll be within a 10-minute drive of United Nations and Museumsmeile. Located in Cologne (Old Town), Centro Hotel Kommerz is within a 10-minute walk of Cologne Cathedral and Romano-Germanic Museum. Self parking (subject to charges) is available onsite.